Finished last night at bedtime and hung to dry fast before calling it a night, grateful I got it done in time: Laura’s cowl. Delivered on her last day at Green Planet Yarns. 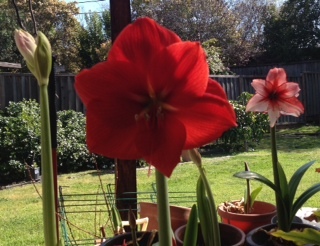 That amaryllis from last week has a second stalk blooming, and I had no idea that bulb had a twin! Last year I went through the seed catalogs with great visions, as one does. I did plant a few tomatoes, and as a matter of fact one indestructible Sungold next to the house from the year before survived 22F winter nights–again–and is still blooming and producing merrily away. 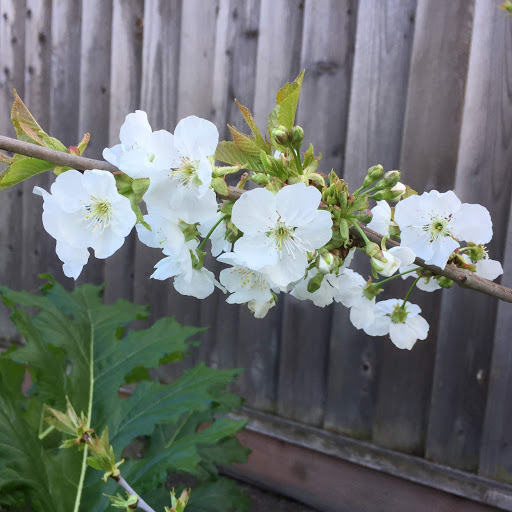 A windstorm blew it backwards two weeks ago but bit by bit it is growing towards the sun again that is likewise reaching out gradually to it. I looked at all those unused year-old seeds though (Big Boys! Blue tomatoes!) 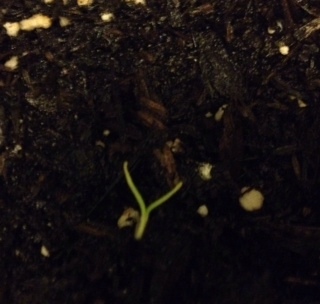 and figured that if I started in January and nothing sprouted then I wouldn’t have lost much time. And if they did, they could be in pots for awhile inside the Sunbubble; I might as well put that heat to the most use I can, right? Look who just showed up. Now that I’ve got an extra bag of soil so I can put it in something bigger than a used creme brûlée pot. I can’t remember if this is the zucchini or a Waltham butternut, but either way this little squash needs more legroom stat. If anything comes up in that bigger pot over there then I’ll have (at least) one of each. Knowing that squirrels sometimes go after new sprouts, I brought it inside for the night. No munching on my seedling. This one’s mine. Edited to add, I posted this and then looked more closely: two! Two Big Boy tomatoes came up today when I wasn’t looking! What they needed was fresh soil and big heavy pots to keep the future multiple sun-tracking stalks from knocking them over sideways. Hopefully. Which is fine, except that I just wasn’t looking forward to that trip down the freeway, much though I like supporting Yamagami’s. It’s a great nursery with a lot of pre-Silicon Valley history to it. And part of that foot-dragging was UV-sensitive hours vs our rush hour that starts just after 2:00; December is safer lupus-wise for walking around outdoors than November. Meantime, in the nice warm house two of them started to sprout a few days ago so I cut holes in their bags and turned them over to un-tilt their sense of direction. Found a third one starting to sprout this morning. The middle one. It did all that in under 24 hours. Okay, that’s it, time to get going, yay for December, and Yamagami’s once again impressed me with what good people they hire. 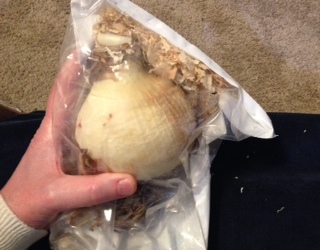 Opening the fourth bag, I’d had no idea that bulb in the foreground had even come out of dormancy. Dark red, wine, white, pink/red/white, with the bags tucked under each for now so I can remember which is which. Thank you, Dad! Can’t wait! Now that they’re finally planted the little kid in me is like, so BLOOM now! C’mon guys, hurry up! 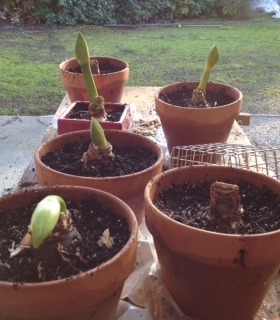 With all six kids gathered round (thank you Frontier for selling $87 Atlanta-Salt Lake no-luggage round trips) Dad offered a Christmas present dear to his heart: four amaryllis bulbs each, and not just any amaryllises but ultra-large mother bulbs. For us two coming-birthday girls it was six. Good thing my luggage on the way there had included a giant tub of extra-ripe dried apricots from Andy’s Orchard for the folks so I didn’t take an underseat suitcase and I had some space freed up for the way home. But the bag. It was still just a carry-on and I was sure the TSA would want to look at those. They definitely did. I seemed harmless, but that way-overstuffed suitcase had to come open even as I was telling the guy what he’d seen on the screen were. 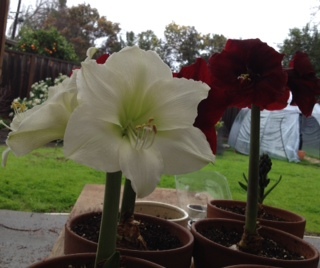 “Those ARE big amaryllis bulbs!” he said in wonder, holding one high for the other agents to see. Clearly he was familiar with such. 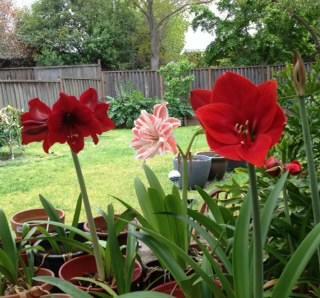 He dug through and pulled out each of the others in turn just to be sure, though–his peers were present–which is how I found out that the sawdust the bulbs were bagged with could pepper-shake out all over everything. That makes sense: bulbs are living things and need to breathe. I may have bought them second-hand on swap.com and the like for $5-$10 each, but still: those were my cashmere sweaters he was freely coating with that stuff, and my favorites to boot. Y’know, what you wear to look good around your siblings and their kids. I’d previously put them through the hand wash cycle on my Speed Queen, which didn’t shrink them any, but the higher-than-average speed of its spin meant the ends of the hairs had worked their way free and gained an angora bunny look and now those wisps of goat fur were grabbing hard onto that sawdust. Later, I could not shake it all out. Fortunately, it turns out that washer could. Speed Queens are magical. Just in case you ever, say, visit a lumber mill in a cashmere sweater. 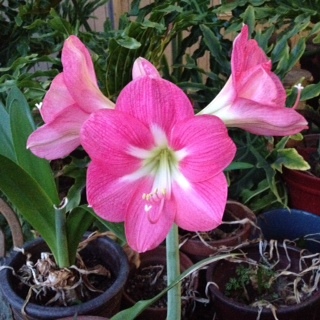 The Spartacus bulb opened up, and at 30″ high with a full display of leaves it is rocking this amaryllis thing. Did anybody else get the annual Community Survey from the Census Bureau? Three million households randomly get chosen and this was our year. After making sure I couldn’t get the info online, I called the city’s utilities department and said, I’m sure you’ve gotten a lot of people asking the annual total of their water+sewer and their electric and gas usage for the Census–and they said, Nope! You’re the first one. I wonder how many people the Bureau chose out of any one town? And how much any answer of mine tilted the results. 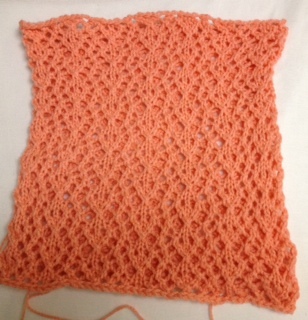 I need to get back to the knitting. Something about being away awhile makes tackling the house the most important thing, though, and the recycling bin is full again a day after pickup. Man, that felt good. Wait–typing that it finally hit me: I have that infrared temp sensor! I got up and aimed for the back of the fridge as the door opened. 34.1, 40 at the front. Okay, I think we’re good, I just have to find and get rid of anything else that might have been damaged and just start over. 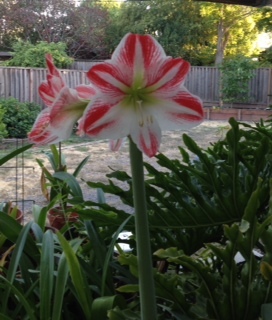 Meantime, the amaryllis-scape for the day. One may have noticed: I like amaryllises. I collect amaryllises of every kind. Pictures taken today. 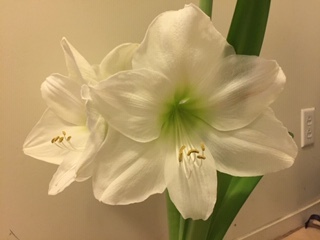 Mine bloom year after year, sometimes skipping years but at this point I have so many bulbs that who would notice? 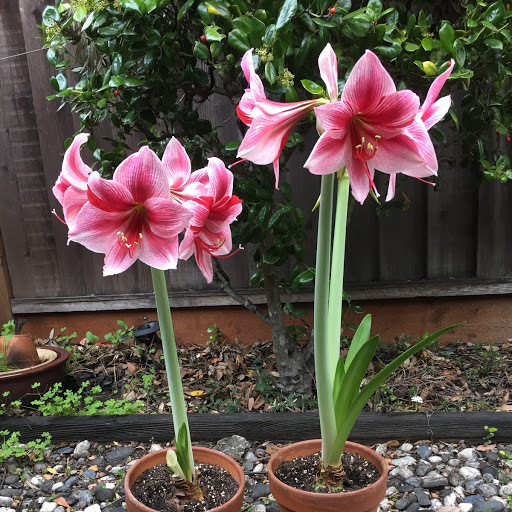 Our climate isn’t warm enough to plant them in the ground so they stay in pots under the translucent patio awning, surrounded by the warmth of the house on two sides. They like shade. Warmth makes them happy. They like this spot. Occasionally you lose one to age or winter temps or whatever. How to tell for sure: if you touch a dormant bulb and it crumples between your fingers into nothingness, it’s gone. If it holds solid at the center, no matter how many crisped outer layers there are, there’s still life in there–it just needs to be cared for and given a chance. 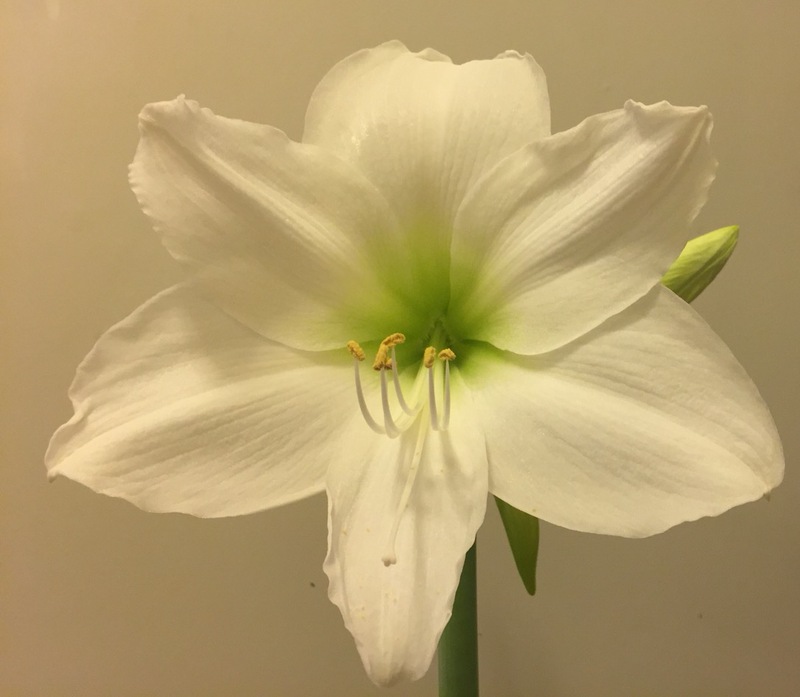 So this one bulb was shriveled and shrunken but just solid enough that it wasn’t tossed but it wasn’t coming out of dormancy either. Maybe it just really wanted any hint of winter to be over first. 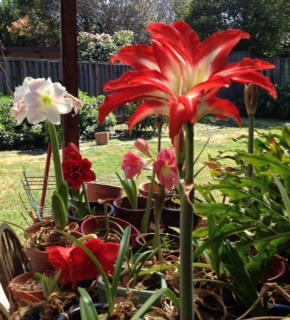 At some point on that crowded picnic table a thriving amaryllis got put on top of its pot and it was forgotten. The turning of the season, the leakage from the one above being watered must have been enough. The fact that we were gone for five days means the changes snuck past unnoticed. I caught a glimpse of red today at pot level and went, wait, what? I stepped outside and lifted off the one I hadn’t even noticed was sitting on top. When did I do that? 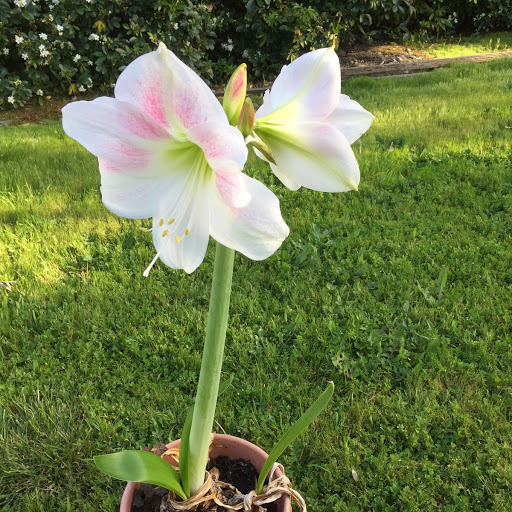 And there, underneath, was a stalk curling tightly around in a half circle against the inside rim of that lower pot with a big bright half-flower trying mightily to open up, resting on the edge. There was a leaf, too, one which had gotten no sun and yet was trying to grow out from underneath its burden. 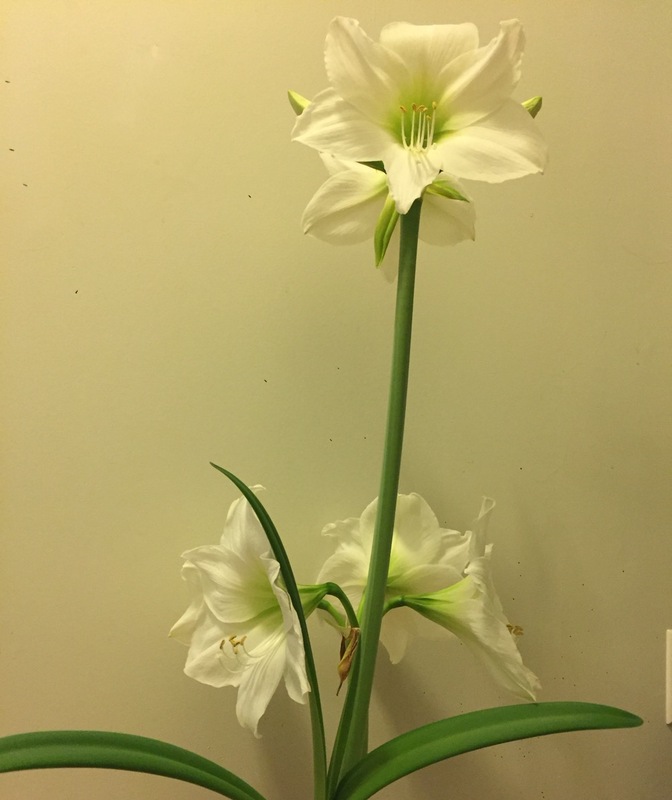 This picture was taken ten hours’ worth of sunlight later: the stalk has risen mightily, the first blossom is fully open and the second is getting there and there is even already some green in that stalk and (you can’t see it) its leaf. Sky and light! But before it was discovered, the only energy available to it to grow and thrive with came from what it had within it. And in the end, that was enough to make the rest work out so that it could share what it was meant to be with the world. 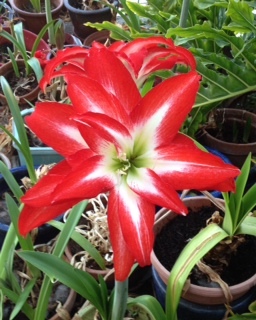 Isn’t that just the most gorgeous shade of red? 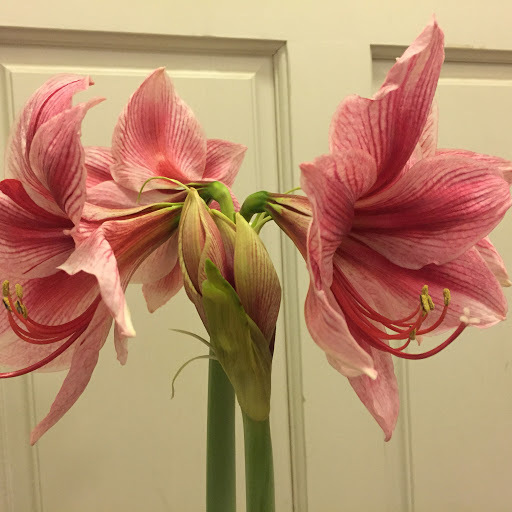 Three amaryllises in bloom, five more coming up so far. I woke up this morning with a clarity of thought: what I want to do today is to get Alex’s hat done. I’d started in the discontinued, densely-spun Zara 14 and my first attempt at matching its thickness for the second stripe had failed–but after yesterday’s mail, I could do it now. Electric blue and black was the verbal request with the artist’s rendering, chunky yarn specifically hoped for. Found both colors from the same line after all. It came out very stretchy and short one blue stripe, being long enough for a good fold-up brim already. (Not to mention my running out of blue.) But I did get that bit of brightness at the top thing going on just like she did and it tickles me no end. 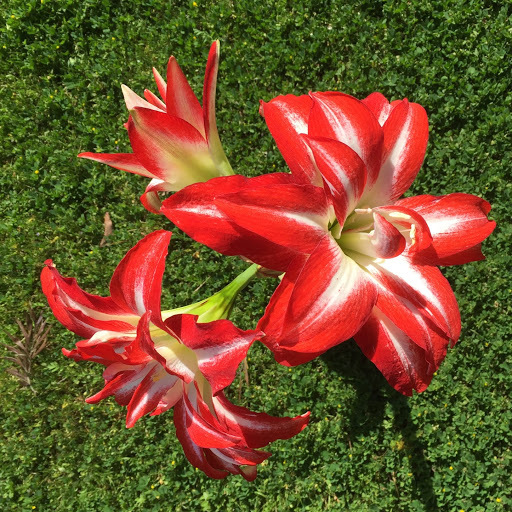 Meantime, look what opened up. In September! 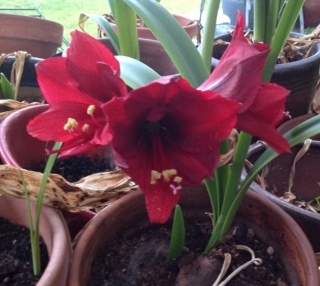 And more amaryllises opening up. So there was the woman at church I don’t know well but I wish I did, whom a worried friend told me was suffering from depression these days. It was a cheerful color, and that can only be a good thing. 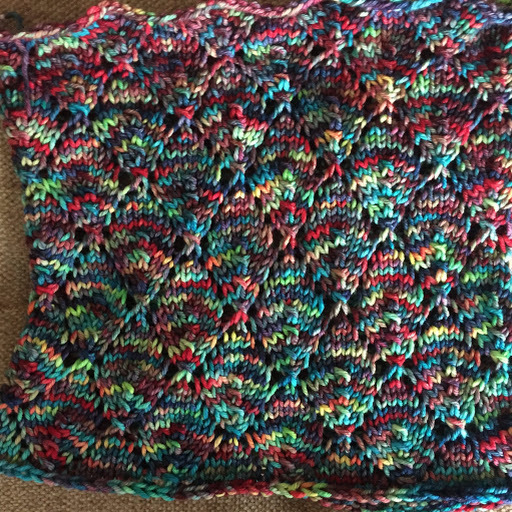 I knew I had a lighter shade that would go well with it–and not only that, it was the last of my stash in blue of the discontinued Sublime yarn made of pearl chips dissolved into a rayon with a high-quality bamboo. It is as soft and shimmery and warm as a good silk while being hypoallergenic; it is, literally, a string of pearls. I’d just moved those two skeins to…somewhere…a few days before. I had actually had them in my hands before that conversation with that mutual friend. Where on earth had I put them? And thus a highly frustrating week, knitting-wise: I wanted to make a cowl for her before Easter Sunday and I could not for the life of me find that yarn. And it’s not like there were so many (normal) places to look, either. I could have just given up and done something else, and almost did, but for the absolute certainty that that was the yarn I needed it to be. It just was. And I didn’t want to start something else for someone else and get sidetracked. I finally found them Saturday. How on earth had they ended up in a ziplock with a wool sweater? Hello, brain? There was no way I was going to get it done, or even very far along before Easter services, but at least I got it cast on and a few rows so she could feel the fabric it would be making. I put it in a ziplock in my purse for the morning, along with a green cowl just to make sure and to let her have a choice–or something else altogether if she wanted, say, pink polkadots. It would be for her to decide. I invited her to sit by me a moment after the first meeting and showed her, apologizing that the blue wasn’t ready. When I offered her an infinity of hypotheticals as well as those two choices she was exclaiming, Oooh, the blue! I told her about the actual pearls made into the yarn and how it had demanded that it be the one I knit for her, even when I couldn’t find the silly things (at the same time, I had needed to be sure it was what *she* wanted.) So she would just have to wait till next week to get it. She loved it. She was blown away. She was very happy about the whole thing and can’t wait to see it finished. Glad I lost it. Glad I found it.